Well it was time to move again and unlike our other moves, we were offloading a lot of items to make way for new ones. And this time we were trading up and buying furniture that would fit our new home, picking pieces for their beauty/quality not just for their affordable price. In any case, we were hoping we could still make some money off of our secondhand stuff so we turned to our beloved craigslist. We did worry that we wouldn't sell everything and would need to pay people to dispose of our bulky items. But eventually, we lowered prices on some and gave away others and everything turned out fine. 1. Get the pricing right - I started off with low pricing on most items since I thought it would take a week to close deals. But for hot ticket items like the sofa and the dining set we got several inquiries within 24 hours. 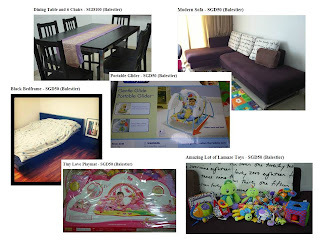 The low pricing helped but I think an extra SGD50 on some items would still have attracted some buyers. 2. Get a deposit to lock in the item - I mistakenly set aside the sofa for a buyer and didn't ask for downpayment. As it turned out, the person couldn't secure a mover to get the sofa and backed out of the deal. I had to lower the price further and repost on craigslist at the last minute just to get the item sold. 3.Wait - I was a bit impatient and when I didn't get any offers the first day for some of the baby items,I decided to give some to my newborn niece instead. Eventually offers trickled in but by then the items were already given away. Well that's done and now we're focusing on getting the new home in order. More stories about the move in my next posts.